If you have been looking for an 802.11ac router with only $100 to spend, you had to settle for AC1750 class or lower or refurbished products. But now Tenda's AC1900 Smart Dual-Band Gigabit WiFi Router aims to let you step up to AC1900 class for under 100 bucks. The AC15 is a Broadcom-based router using components very similar to products from better-known vendors. So we'll see how the AC15 stacks up against the better-knowns We'll also take a look at the feature set and user interface, since this is the first time we've reviewed a Tenda router. The AC15 is fairly large measuring 8.9 x 7.07 x 3.02 in (226 x 179.5 x 76.6mm). For those with limited desktop real estate, you'll be happy to know the AC15 is designed to stand almost vertically using the optional mounting foot that tilts the body to the rear by a few degrees. The total specified depth includes the depth of the mounting foot. The black glossy case has a molded quilt pattern on the front panel. The top and the rear of the router have vent holes to provide good ventilation. The three antennas on the top of the router are 3 dBi dual band antennas. They aren't replaceable, so you can't upgrade to higher gain antennas. As shown in the callouts below, the LED status indicators are arranged in a line across the top of the router. You can turn off all the LEDs except Power via a companion app. The web-based UI further allows scheduling LED on / off times. The image below shows the top and rear panels of the AC15. Across the top are buttons for WPS (Wi-Fi Protected Setup) and a Wi-Fi on/off switch. There is also a pin reset hole that returns the router to factory defaults when depressed for 8 seconds. Across the bottom of the rear panel, (left to right) there's a power on/off switch, power jack, USB 3.0 port, Gigabit WAN port and three Gigabit LAN ports. The AC15 is powered by an external 12 VDC 2.5A power supply. It's unusual to see only three LAN ports on a router; most have four. It's particularly surprising since the Broadcom SoC has built-in support for five Gigabit ports, which competitive products assign as one WAN and four LAN. We opened the router after testing to get a better photo of the main board than found in the FCC certifications docs. The Broadcom SOC is on the left center of the board. The 5GHz radio is in the center of the board and the 2.4 GHz radios is to the right. All key parts have thermal pads coupling to the RF can tops (removed for the photograph). The image below, taken from the FCC certification photos, show everything covered by a massive heat sink. Table 1 below summarizes the key components of the Tenda AC15 and three products we'll be using for performance comparison later. All are Broadcom based designs. Note the Tenda uses the other and less powerful BCM4708A instead of the BCM4709A. Like many routers, setup is quite simple. A quick start guide shows how to connect your router and modem and a wired PC. A first run wizard walks you through a short setup procedure. To access it, just enter tendawifi.com in your browser address bar. Alternatively, the default IP address is 192.168.0.1. The AC15 arrives with a unique SSID based on the format Tenda_xxxxxx, where xxxxxx is the last six digits of the MAC address. Similarly, the 5 GHz network has the format Tenda_xxxxxx_5G. Both wireless networks ship with WPA2 pre-configured with a password. That password is printed on a label affixed to the clear protective sheet that covers the front panel as well as on the permanently affixed label on the rear of the router. You can also set up the AC15 using either its iOS or Android app. I'll be discussing these later. The AC15 is designed for ease of use. But many of the features available in other Broadcom-based routers are missing in the AC15. I decided to compare the features of the Tenda AC15 with a fairly full-featured AC1750 class router, the Amped Wireless RTA1750. Starting with that feature set, I used strikethrough text to show features not included and bold text to show differences in features or added features of the Tenda AC15. Virtual Server entry for single or multiple ports with TCP, UDP or all protocols forwarded. Enable/disable for each entry. Port filtering – can set individual or range of incoming ports. Allows you to enable or disable TCP and UDP ports on network devices. The image below shows the AC15's landing page. I'll work through the main menus shown along the left side of the screen and comment on either unique features, or those that are missing on the AC15, but are found on other AC1900 class routers. Internet Status - When you log into the AC15, you land at the Internet Status page. The page shows if you are connected to the Internet, the number of attached devices, the number of blacklisted clients and wireless settings. If you click on Attached Devices, a list of devices appears along with the MAC address, connection type and provides the option to black list (block) devices. Clicking on Wireless settings lets you change the SSID and network password for each band. Internet settings - Your choices for Internet connection type are DHCP, PPPOE, or Static IP. Other features commonly associated with WAN settings such as setting the MTU, the speed of the WAN port and MAC address (default, manual, Clone this address) are found under System Settings, WAN settings. Unfortunately, there aren't many settings available here. You can't, for example, specify DNS addresses to be used when DHCP leases are created. It defaults to the gateway address for one DNS address, and 8.8.8.8 (Google's public DNS) for the others if used behind another router. Wireless settings - In this menu, you have basic control over Wi-Fi Name and password and a Wi-Fi Schedule to create a Wi-Fi Off period that can be repeated every day or on specified days. You can also set up wireless repeating, control the operating channel and bandwidth on both bands and Signal Condition (low, medium or high transmit power) on each band. WPS can be enabled or disabled. There's a WPS "soft" button in the UI, and PIN access is also supported. Surprisingly, there were no options for security settings. I'm assuming that under the hood, security is set to "Auto". Enterprise wireless security (RADIUS) is also not supported. Other than the schedule option, there's no way to turn off the radios from within the UI. There is, however, a hardware switch on the top of the router that shuts off wireless on both bands. 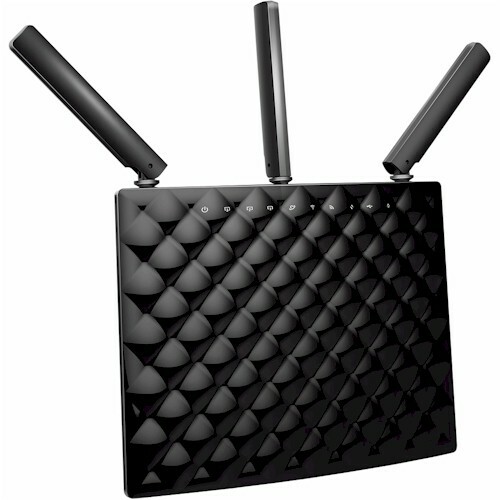 Guest Network - the Tenda AC15 supports a guest network on both 2.4 GHz and 5GHz. Each network can have a different name, but both share the same guest network password. The guest network operates on a different IP subnet (192.168.10.0/24). There are no settings for wireless client isolation, or to allow/deny access to resources on the "home" wireless network. Smart Power Save - This allows you create a schedule for turning your router off and on. If enabled, it will repeat every day. In the default schedule which is midnight to 7:00am, the router estimates that it will save 2.92 kw-h/month. You can check an option to delay the start time. The router remains active unless data is transmitting at less than 3KB/s for thirty minutes. USB Application - there are three choices in this menu: File Share, DLNA and Printer Service. File share, the default login is admin/admin. You can change the password, but you can't create additional users. You can access the files via FTP on the local LAN, or via SMB using \\192.168.0.1. Other options include safely eject the storage device, and allow visits from the Internet. DLNA - you only options are enable/disable and to name the DLNA server. There are no options to refresh the media server database. Nor is there a status of the rebuild nor any statistics on the amount of media indexed. I enabled the DLNA server and it indexed all of the content on my standard 16 GB multimedia test flash drive. All media types played as expected using one of my DLNA clients on my iPad. Printer Service - there are no options other than Enable/Disable. VPN - The only options are PPTP server enable/disable and PPTP/L2TP client enable/disable. If you enable the PPTP server, the default address pool is 10.0.0.100-10.0.0.200 with an option for MPPE encryption. You can add users and passwords for VPN users. The final two menu options have a quite a few sub menus - many of which are self-explanatory - so I'll include two screenshots and comment as appropriate. TendaCloud - allows you to remotely manage your router with mobile apps. You need to create a TendaCloud account and link your router to your account. Remote Web - specify port for remote access to your router. Note: HTTPS not supported. DDNS- your choices are limited to no-ip.com, dyndns, and 3322.org. Virtual Server - Port forwarding is VERY basic. You can configure only individual ports - there's no port range forwarding. Nine Internet services (such as FTP, Telnet, HTTP, etc.) are pre-configured. You don't have any control over which protocol to use - I'm guessing that they enable TCP and UDP for any rules you manually create. In addition, port triggering, a feature popular with gamers, is not supported. UPnP - Enable or disable UPnP. When enabled, a list of ports, hosts and protocols (UPnP port map) appears. IPTV - This allows you to enable Multicast and STB (Set Top Box). The STB should be connected to the LAN3/IPTV port on the router. System Settings - Only a couple of these menus need any explanation. LAN IP Setting - You can enable/disable the DHCP server and choose a DHCP lease time from a drop down list that ranges from one hour to one week. The AC15 does not support DHCP lease reservation. IPv6 is not supported. System Log - the log shows only basic entries, and does not have provision to log to an external Syslog server. Auto Maintenance - This is a feature that I've not seen on any of the routers I've reviewed. This allows the router to automatically reboot sometime between 3:00am and 5:00am in order to maintain itself. This only happens if traffic drops below 3KB/s. Time & Date - This is the MOST basic time/date setup I've ever seen. You can only select a time zone. There is no support for daylight savings time nor can you configure which NTP server to use. And, should you not be connected to the Internet, you also can't manually set the time/date on the AC15. Tenda provides mobile apps for iOS as well as Android. Both apps are designed for phones. The Play Store said the Android app was incompatible with my tablet, so I used the iOS app on an iPad. The mobile apps provide a subset of the features available via the web interface. You can, however, set up the AC15 using either app. I set up the review unit with my iPad. The image below shows the Tenda iOS landing page after login on my iPad. The people image in the upper left corner takes you to the Tenda Cloud Login. The Menu icon in the upper right corner takes you to the administrative page. The gallery below shows screen from other menus shown at the bottom of the screen. The UI on the iOS app and the Android phone app is virtually identical. Routing throughput was measured using our standard router test process with the Tenda AC15 router loaded with V15.03.1.10_EN firmware. Table 2 summarizes the results and compares them to the three routers mentioned previously. The Tenda AC15 had the highest simultaneous throughput, but had the lowest WAN - LAN throughput of the four routers compared. Like the TP-LINK Archer C9, the Tenda AC15 supported over 30,000 simultaneous connections. We consider anything over 30,000 connections as equal for ranking purposes. The Tenda's performance is closer to the Archer C9's than the Linksys and NETGEAR. For the unidirectional tests, the IxChariot chart below shows the cyclical variation typically seen in this test. Average uplink is slightly higher than downlink; nothing to get too worked up over. The simultaneous up and downlink test shows the router had some trouble maintaining smooth traffic in both directions. Note up and downlink directions trade places on top at various times during the test run. The chart below shows results for all AC1900 class routers tested with the latest testing methodology. I've highlighted the results for the Tenda AC15 to make it easier to find. For NTFS Write, the Tenda came in at number four with 33.3 MB/s - almost exactly half of the throughput achieved by the Linksys WRT1900AC router. For NTFS Read, again the Tenda AC15 was number four with 51 MB/s, about 2/3 of the Linksys chart-topping 75.1 MB/s. Considering the AC15's price, however, these results are pretty good, especially when compared to other significantly pricier routers. The AC15 was tested using our Version 8 Wireless test process with V15.03.1.10_EN firmware loaded. The image below shows the AC15 inside the wireless test chamber. The router was laid down for testing because its normal upright position would have put its antennas above our chamber antennas. Previous experience has shown this negatively affects results. The Benchmark Summary below shows the average of throughput measurements made in all test locations. Here we see the same performance results for storage and routing performance that were presented in comparative tables and images above. We'll drill down on the wireless performance in the Throughput vs. Attenuation charts below. Our throughput vs. attenuation plots were generated comparing the Tenda with the same three other AC1900 class routers used throughout this review: the Linksys EA6900; NETGEAR R7000 and TP-LINK Archer C9. For the 2.4 GHz downlink test, the AC15 started out with a fairly large advantage and held it until about 27dB of attenuation. At about 33 dB, it dropped slightly below the plots of the three, but still held its connection out through 60 dB of attenuation. Only the NETGEAR R7000 still had a connection at 63dB. For 2.4 GHz Uplink, the AC15 started lower than the other three routers and stayed that through most of the tested range. The NETGEAR held a clear advantage over the other three routers from about 30 dB of attenuation out through the end of the test at 60 dB. For both 2.4 GHz tests, the slopes of the plots was very similar. For the 5 GHz downlink tests, with the exception of the Archer C9, all of the other routers started out the test above 500 Mbps. The AC15 dropped below the other three at 12dB and stayed below the other routers for the balance of the test. For 5 GHz uplink, the AC15 started essentially tied with the Linksys EA6900 but then tracked lower than the other three products, but with the same slope. Along with the NETGEAR R7000 and the Linksys EA6900, the AC15 dropped the connection at 42 dB of attenuation - one test before the end of the range. As with the downlink tests, only the TP-LINK C9 remained connected at 42 dB of attenuation. The Router Ranker calculated a total rank of #8 for the Tenda AC15. However, if you sort the ranker by price (right), the Tenda AC15 is the cheapest AC1900 classs router we've tested. The performance summary below shows a category performance comparison of the AC15 and the top-ranked NETGEAR R7000. As you would expect from the benchmark summary above, the Tenda AC15 had decent category scores for routing performance and Max simultaneous connections. But the category scores for wireless performance trailed the NETGEAR R7000 for all categories except for 2.4 GHz Max. Throughput. So, sure, the AC15 isn't as good as some top-ranked routers. On the other hand, it's not as bad as some of its more expensive competitors either. Comparing the AC15 to the TP-LINK / Google OnHub and ASUS RT-AC68P shows it holds its own with the ASUS and outperforms the OnHub in three out of four benchmarks. Our key reservation in recommending the AC15 is that Tenda is relatively unknown in the U.S. But they have a California office and even U.S. phone support with a number prominently displayed on a card that comes in the product box and is listed on Tenda's website. So, all things considered, the Tenda AC15 is a pretty good value in an AC1900 class router. It may not have all the features on your "must have" checklist and it's not going to eliminate all your Wi-Fi dead spots (what router will?). But it has enough features to satisfy folks who just want to install a router and never log into its admin interface again and a cheap way to move up to the benefits an AC router can bring to most any WLAN. It's can also be a cost effective way to add an AP to your network. In fact, I may replace my old "N" AP with it.